We’ve been hard at work on The Girl Who Ignored Ghosts, which comes out on 8/1/15. The response from bloggers and reviewers has been terrific. 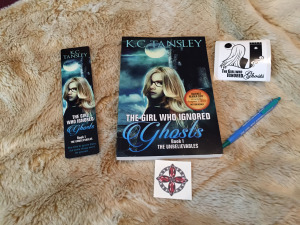 There are some great giveaways going on right now where you can win copies of The Girl Who Ignored Ghosts. There are a few more days left to preorder your copy of The Girl Who Ignored Ghosts. Author K.C. Tansley has free bookplates for anyone who preorders the paperback and can’t get to one of her signings. You can contact her for details on how to get your personalized bookplate. Tansley has some great author events coming up this summer and fall. Check out all the places she will be on her book tour. She will be sharing author goodies at her signings too. The book’s Facebook Launch Party will be on August 3rd from 6 p.m. to 8 p.m. EST. Stop by to play party games and win cool prizes.